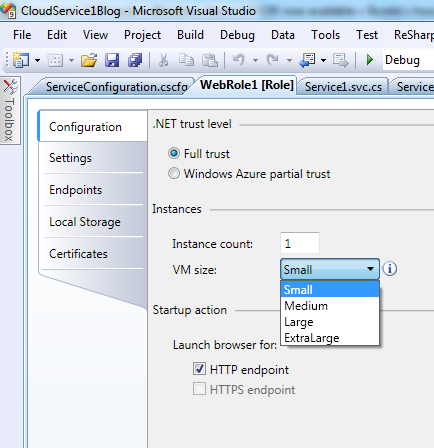 In my previous post on the newly released Azure SDK I touched on the ability to set a size for your VM instance. The sizes are easy to follow, they are all just multiples of the base VM size. Microsoft have said in their FAQ that the pricing is based on multiples of the small VM size. It is based on “CPU cores / hour”, so $0.12 per hour for the small VM, $0.24 for medium, $0.48 for large, etc. With more details on Windows Azure to be announced next week at PDC, Microsoft have released the latest version of the Azure tools & SDK in preparation. There are a few things we can learn from them. “Service Model UI: A redesigned and significantly more complete interface for manipulating Role configuration information. To access, double-click on a role node in the Solution Explorer” – This feature is quite nice, we don’t need to manually edit the .cscfg file, we have a nice UI to change it instead. “Ability to choose the size of the VM for a role instance” – Microsoft has previously stated that we will eventually have “more control” of the VM instances, but this sounds interesting. You can find about these VM sizes at this url http://msdn.microsoft.com/en-us/library/ee814754.aspx. They differ in CPU counts and RAM. Perhaps there is some new pricing to be announced at PDC based around this? But this is what I have been hanging out for! “Service Runtime library updated to support inter-role communication and notification of configuration changes” – I have a bunch of research ideas that required this feature. Queues are great for structured sequential data and is the way you should be processing data between instances. But for things like network rendering you really needed this feature. This year I was able to present at Code Camp! In my mind, Code Camp is meant to be an event where you try and to whacky things with code. So I decided to explore what the possibilities were of using Windows Azure to create Artificial life in the cloud. I ended up focusing more on the possibilities of farming out the work of calculating genetic algorithms to find optimal paths for the travelling salesman problem. The first section gives a background on cloud computing and Windows Azure. If you are interested in an overview of Azure i recommend you watch my Remix presentation on Windows Azure instead, as I did it after this talk and had a chance to refine that section further. The talk went well, unfortunately the video capture software I was using was eating up one of my cores on my dual core laptop 😦 which meant the calculations ran slower than they should have. I apologise for the audio quality also, I didn’t have the drivers for my laptop microphone so ended up having to use my mobile phone to record the audio. I hope you enjoy my talk! Artificial life in the cloud, using Windows Azure on Vimeo. This year I was invited to speak presenting on Windows Azure at Remix, Microsoft’s Annual web technologies conference. The video is available online in both low and high quality (unfortunately the aspect ratio is weird at both qualities).